We’d love your help. Let us know what’s wrong with this preview of My Counterfeit Self by Jane Davis. To ask other readers questions about My Counterfeit Self, please sign up. We meet Lucy, poet and activist, on a morning that finds her angry and bereft. It is a few hours to the funeral of Dominic, her critic and sometime lover, and Lucy has just learnt that she is about to be honoured for her services to poetry. She shreds the invitation – from the Palace – to ribbons, destroying with it her beautiful summer garden, and we see in one graceful move Lucy’s grief over her loss and her anti-establishment zeal. Jane Davis then takes us back in time, to Lucy’s childhood in a dysfunctional family and to her contracting polio. In doing so, Davis allows the reader a glimpse into Lucy’s earliest influences. The long stay in hospital that has her turning to books; the governess who teaches her to question all she is told. We follow Lucy’s path, and the path of the protests against war and nuclear testing for the following decades. We are witness to her unconventional marriage and the enduring complexities of her relationship with Dominic. This book drew me into its pages with a strength of writing that just kept me reading. Lucy’s life unfolded asynchronously but not chronologically. We hear how people and events shaped her self awareness but caused her to hide her true self and intelligence. I identified with her struggle to make herself understood in a world that largely tried to restrain her to the norms of society. Thank you, Jane Davis, for another thought provoking novel that was not at all counterfeit. Another excellent book from Jane Davis. Refreshingly not one of her books is alike. This is about a rather irascible old lady reflecting on her life as a social activist, using the medium of her poetry. It covers a period of time that is very familiar to me and brought back some surprising memories. I feel that this is an amazing book. I t kept me turning page to page. I read half the book before I could put it down. Watch this space for my review of this powerful novel! I received an e-book ARC of this title for purposes of an honest review. It’s a good sign when characters live in my mind as real people do, provoking me to exasperation and twangs of pity, then satisfyingly resolving to a comfortable wash of recognition and acceptance. So has Jane Davis conjured Lucy Forrester: the sensitive child in an iron lung, the misunderstood and unappreciated adolescent, the self-righteous maturing young woman, and finally the “same old Lucy” who is up to her old activis I received an e-book ARC of this title for purposes of an honest review. It’s a good sign when characters live in my mind as real people do, provoking me to exasperation and twangs of pity, then satisfyingly resolving to a comfortable wash of recognition and acceptance. So has Jane Davis conjured Lucy Forrester: the sensitive child in an iron lung, the misunderstood and unappreciated adolescent, the self-righteous maturing young woman, and finally the “same old Lucy” who is up to her old activist tricks but no longer her “counterfeit self.” Consider an aging Lucy at the Palace in indigo and raspberry, her once-cold and lonely heart stirred with compassion and zeal and even a long-seasoned love. She reminds me of the infuriating Olive Kitteridge (from the eponymous novel by Elizabeth Strout), who has a flashing cameo in this novel. Both characters come to life in their literature, and I leave My Counterfeit Self feeling not that I’ve had a good read but that I’ve met an intriguing person. To be frank, I got tired of Lucy as, one by one, she pruned off her unworthy schoolmates and family members (though surely some people DO have thoroughly awful family) and set the terms of her relationships, even conspiring to manufacture her success as a poet, sailing through all in impeccable self-justification. She protests the usual checklist of liberal causes – even bringing her own plastic chair to avoid the tainted leather of a TV talk show stage (while recalling a protest picnic of tuna sandwiches – dolphin-safe, I hope!). But when her nuclear protest matures beyond a child’s reflexive concern and a demonizing of nuclear energy itself to focus on the cause of veterans harmed in nuclear testing, Lucy becomes more human. I found myself engaging with her cause more fully as Davis recounts the experience of bewildered soldiers told to turn their backs to a nuclear detonation on Christmas Island and the British government balking at providing benefits when those veterans develop rare cancers decades later. Lucy breaks out of her iron lung and moves beyond the “Machine Girl” of the childhood poem that made her famous. Though Lucy Forrester’s movement through the world is mechanical and counterfeit for decades, we have the privilege of witnessing her coming to life and fuller humanity especially in her very complicated romantic life. Although it feels a shortcut to have lover Dominic disappear for years when he does, his re-entry into life with Ralph and Lucy comes when Lucy has finally matured enough to make the most of it. Davis plunks us Forrest-Gump style into different significant years in Lucy’s – and the world’s – history, giving us snapshots (the steady and appealing Ralph is a photographer, by the way) that convey what Lucy can become. The very affecting opening scene of the novel – Lucy in the rose garden with a Palace invitation and a wicked set of shears – captures, as does Ralph’s photo of the tableau, the promising complexity of what will come. I first noticed Jane Davis as I became a debut novelist myself this year, and I immediately knew she was doing it right with quality production (gorgeous covers and website, slick promotional materials). I joined her mailing list to get a copy of I Stopped Time – surely an independent author doing it so well on the business end of her career is likely to be writing quality books, as her reviews and awards attest. I was right. Enjoy My Counterfeit Self, keeping in mind as Lucy exasperates that the very title is a confession from the standpoint of age and experience. Then try another Jane Davis title – I Stopped Time is next for me! Jane Davis never disappoint me. Such a talent for story telling. Every book is unlike the last one. Another great book. Another great story. This was the first book I’ve read my Jane Davis. It is very well crafted and introspective. I think the subject matter is very timely and while I don’t care for the back and forth in time style of this book, it made sense as I was reading it. I’d definitely recommend it if you are into good literature with a lot of meat to it – this is NOT a light and breezy read. I really enjoyed the story of Lucy's illness and how Pamela helped her, but I felt like the story fell apart as she grew. Clearly, the author & Lucy are dedicated to nuclear disarmament and I did learns good deal of British history, but I feel cheated. Another great, great story, written by the extremely gifted author, Jane Davis. Her words paint pictures, in your mind and heart and soul. A wonderful book. The story begins with a young impressionable girl, stricken by polio, confined to an iron lung, her neck in a brace, her parents emotionally absent, her ability to experience all life had to offer her at not quite 10 years of age limited by her imagination and her life support. She is paired with a forward thinker, a governess with clarity about what constitutes right and what constitutes wrong. A questioner who permitted her charge, nay encouraged her charge, to read and to question. Who said history was written by the victors, or words to this effect. I am personally in agreement with this governess. As the young girl begins her recovery from polio, the governess continues to open her mind to injustice, and the actions necessary to bring attention to the injustices. The governess builds her mind and her body. Our heroine, Lucy, and her two friends, the dashing lover Dominic, and the gay photographer Ralph, live together and grow old together. There are many years unaccounted for, their personal stories are told in retrospective and consequently remembered like an old person will remember them, hazy highlights where one perfect summer day represents for the elder the entire decade between first kiss and heartbreak, one disagreeable person the entire memory of secondary school. It is too fast for this reader, too much “and then life happened” sensibility. To fully experience the final chapter mandates a more full experience of the heroines journey to that place. It reminds me of the stiff upper lip we are often treated to in regards to a British man’s sorrow. I wanted to feel a deeper connection with her. We were treated to one chapter describing the events that form the basis of the final protest, and none of how these events influenced Lucy. I wanted to experience her horror, her burgeoning knowledge, her comprehension, the hopelessness she must have felt, the indignation, the gradual awareness that somebody had to do something, and the somebody was herself. Her actions were the natural consequence of a series of events and I wanted to know what those events were. How they unfolded in her consciousness. What I got was an old person’s retrospective. It was sterile, removed from the day to day. And somehow more horrible because I was removed from it, a tourist in a tragedy created, orchestrated and mandated by the governing politicians. The telling of this tale was sparse. More sparse that I wanted, and I can imagine Ms. Davis crossing out, cutting down, removing entire section of well-written material in favor of this sparseness. The extreme editing left me hungry. I wanted the title, “My Counterfeit Self,” to be more developed, rather than a throw away at the end of a chapter. I do not know what the author intended by such a provocative title, but I wanted to. The author courageously told the tale through a retrospective lens, while I the reader, only experienced the distance of time. Disclaimer … I received a free copy of the book in return for an honest review. Jane Davis’s sixth novel, My Counterfeit Self, has three main characters and three interweaving story strands. The first strand is the story of a lifelong relationship between a poet, a critic and a photographer – the complexities of which reveal themselves, layer by layer, as the novel unfolds. The second is the story of an extraordinary mind emerging out of a struggle with both childhood neglect and childhood polio. And the final strand is an account of the British anti-nuclear movement, starting Jane Davis’s sixth novel, My Counterfeit Self, has three main characters and three interweaving story strands. And the final strand is an account of the British anti-nuclear movement, starting with the Aldermaston march in 1958, and in particular of the fight for justice for the professional soldiers and National Servicemen whose lives were wrecked when they were ordered to act as observers in Britain’s nuclear test programme in the central Pacific in the 1950s and 60s. Lucy was one of the lucky ones. She survived polio with only a chronic weakness in one leg to show for it. Deceptively tough, she has a lifetime putting herself in the way of controversy and risk, and of eschewing convention and risk. She reminds me of a childhood heroine of mine, the Canadian painter, Emily Carr, author of Klee Wick. Almost certainly not an easy person to live with in real life, Lucy is a joy to spend time with between the pages of a book. 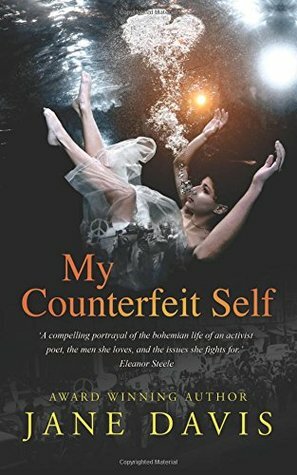 My Counterfeit Self is a book that packs a punch beyond the realm of fiction – a piece of ‘activist fiction’ to stand in for Lucy’s imagined activist poetry. Lucy Forrester survives childhood polio and a miserable relationship with her family to become a respected poet and campaigner. The action of the novel goes back and forwards in time from the late 1940s to the present day and follows her life and relationships with the two men she loves as well as her involvement with the protest movements against establishment injustice and concealment that took place during much of that time. I found the historical aspects of the novel very interesting and they Lucy Forrester survives childhood polio and a miserable relationship with her family to become a respected poet and campaigner. The action of the novel goes back and forwards in time from the late 1940s to the present day and follows her life and relationships with the two men she loves as well as her involvement with the protest movements against establishment injustice and concealment that took place during much of that time. I found the historical aspects of the novel very interesting and they awakened memories - the Campaign for Nuclear Disarmament was often in the news in my early life - but be warned: much of the detail Davis includes is shocking and disturbing. Jane Davis is the author of eight thought-provoking novels. Her debut, Half-truths and White Lies, won the Daily Mail First Novel Award and was described by Joanne Harris as ‘A story of secrets, lies, grief and, ultimately, redemption, charmingly handled by this very promising new writer.’ The Bookseller called her 'One to Watch.' She has since published six further novels, These Fragile Things, I Jane Davis is the author of eight thought-provoking novels. Her debut, Half-truths and White Lies, won the Daily Mail First Novel Award and was described by Joanne Harris as ‘A story of secrets, lies, grief and, ultimately, redemption, charmingly handled by this very promising new writer.’ The Bookseller called her 'One to Watch.' She has since published six further novels, These Fragile Things, I Stopped Time, A Funeral for an Owl (which have been endorsed by Compulsion Reads and Awesome Indies) An Unchoreographed Life and An Unknown Woman, which Writing Magazine and named their Self-Published Book of the Year 2016. Her latest release (1st October 2016) is My Counterfeit Self. Jane lives in Carshalton, Surrey with her Formula 1 obsessed, star-gazing, beer-brewing partner, surrounded by growing piles of paperbacks, CDs and general chaos.